Lamia Karim, 2011: Microfinance and Its Discontents: Women in Debt in Bangladesh. Minneapolis: University of Minnesota Press. Microfinance has built a significant part of its reputation on the assertion that small loans empower women. The assumption that every human being has entrepreneurship potential, but only lacks access to credit, underlies this “social business” intervention. The joint appeal of entrepreneurship and empowerment has cajoled many funders and donors to invest in microfinance. But critical research has been shedding doubt on the assumptions of empowerment through microfinance entrepreneurship for quite some time. Can or cannot a direct transfer of credit rouse the dormant and innate entrepreneur which lies within every woman? Lamia Karim’s brave new book, “Microfinance and its Discontents- Women in Debt is Bangladesh”, delves deep into the social realities within which microfinance operates, in order to answer that question. As an Associate Professor of Cultural Anthropology at the University of Oregon, she performed research among the clientele of the four major microfinance NGOs in Bangladesh (Grameen Bank, Proshika, BRAC and ASA) first between 1998 and 1999, and following up in 2007. Norms and obligations in a rural society are tilted against women, as is demonstrated by a proliferation of ethnographic accounts in Karim’s book. Take, for example, the incident of an elderly widow in Bangladesh, who was caught by her nephew on her way back home after taking a fresh loan from Grameen Bank. He pressured her into handing over the money to him because, he said, as his aunt it was her duty to help him start his business. The book’s publication is well-timed with the growing skepticism about microfinance’s impact after last year’s crisis in Andhra Pradesh. The book explains women’s continued marginalization in spite of their increased access to credit through the mismatch that exists between microfinance’s neo-liberal assumptions and the ground reality of the post-colonial state of Bangladesh. The NGO bureaucrats operate under a donor-driven methodology, which ideologically ignores existing rural power structures, and therefore prompts unexpected reactions. In one of her numerous examples, Karim cites a case where clergy from a local madrassah (Yunussia Madrassah, no relation to Dr. Yunus) issued a fatwa against a “developmental fair” that was to be held by the microfinance NGO Proshika. Because fairs are associated with “un-Islamic activities”, the madrassah sought to prohibit it – physical and verbal violence against the women who attended anyway ensued. At the very least, such anecdotes show the importance of understanding local custom, even (or especially) for market-oriented interventions like microfinance. In analyzing the social structures which women are embedded in, Karim’s book carries forward the notion of women’s “positional vulnerability” suggested by earlier ethnographic works on microfinance and gender, including Aminur Rahman’s seminal work. MFIs prefer lending to women borrowers because it is easier to shame them into repayment. Similarly, Goetz found in her interviews with NGO fieldworkers in Bangladesh that women can be more easily located and harassed near the home, making them easier to handle as borrowers. NGOs operate within neoliberal principles of competition, profit, and entrepreneurship. I found that the women who benefited from the microfinance loans shared similar demographics – they were heads of households, their husbands granted them autonomy in financial matters, they lived independently from their in-laws, and many had married within their native village, which granted them more mobility. Karim suggests there is a gap between MFIs’ perceptions of borrowers’ capabilities and the actual constrains women face due to their position in the gender hierarchy. On the one hand, we have the female borrower who is constrained by her kinship obligations and who has to transfer her loan to a male relative if he demands it. On the other hand, we have the bank manager who understands microfinance as a commercial venture and who imagines an autonomous and rational female subject who freely makes choices in the market. According to Karim, the gap between lenders’ perception of women’s autonomy and women’s actual lack of autonomy is caused by MFIs’ ignorance of the complex sets of obligations placed on women. Women are effectively subjected to two sources of authority in the microcredit relationship: the social authority of the borrower group, and the patriarchal authority of the household. Karim questions whether the (prevalent) 98% repayment rate, itself a great attraction for Western funders to invest in microfinance NGOs, is actually a voluntary repayment; or whether the money is coercively recovered. She describes how the culturally specific “governmentality” of the NGOs is used to create an “Economy of Shame”. The author cites the practices which NGOs adopt against defaulters, which include breaking houses (ghar bhanga) in order to recover loans by selling the components of the house. Karim’s vivid descriptions make the gravity of such situations perceptible to the far-removed reader through the tool of ethnographic narrative. For example, she tells the story of a man who broke down a house along with other members of the borrowing group to recover the loan for the NGO, despite it being his brother’s house. 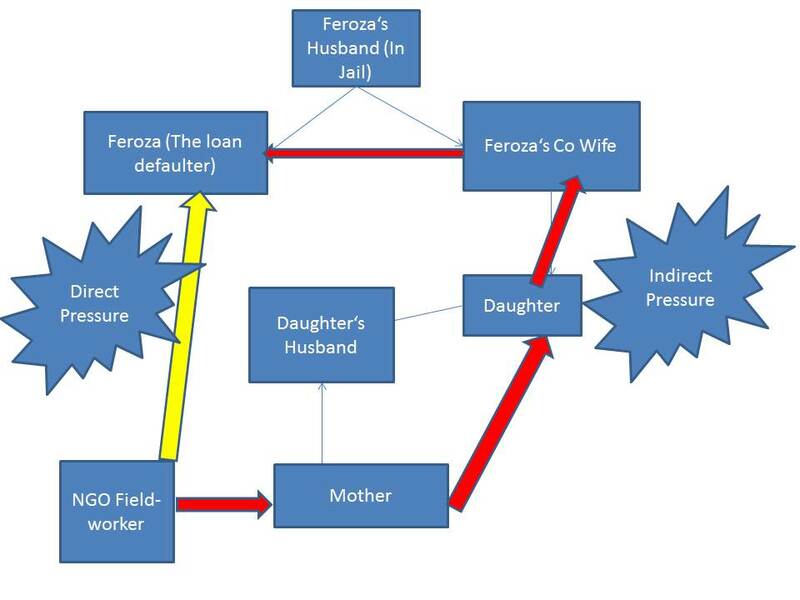 The case of Feroza, whose default on her loans caused her co-wife’s daughter to be sent back from her husband’s village to her natal village, a deep source of shame, demonstrates the complicated pressure relationships which exist in a credit transaction between NGOs and borrowers. The NGO fieldworker who was in charge of both villages had refused to give loans to the girl’s mother-in-law until Feroza (her step-mother) paid back her loan. This caused a complex pressure relationship to be put into action (see diagram). It is these insights which the ethnographic richness of Karim’s book drives home, which statistical inquiries into microfinance effectiveness and NGO discourse can never relate. Inside, as well as outside of the village, microfinance NGOs’ power in Bangladesh should not be underestimated. Karim provides evidence to show the rise of the NGOs as a shadow state, providing and controlling important public services like health, education and credit. The preference of Western donors for channelling their money through the networks of such NGOs has caused a bitter rivalry between the government and the NGO sector. The recent incident when Hillary Clinton employed diplomatic pressure on Sheikh Hasina’s democratically elected government to drop charges against Muhammad Yunus, founder of the Grammen Bank, is a case in point. Karim highlights the conflict of interest arising in MFI-sponsored research, as researchers can rarely criticize “their” institution’s practices. The good will and obligations that exist in the social relationships between MFI leaders, bureaucrats and the educated elite make a critique of microfinance generally socially unacceptable. Karim criticizes the construction of a hegemonic and technocratic discourse over poverty research led by the NGO community. She describes two forms of researchers working with the NGOs: one which is lesser “qualified”, yet more knowledgeable in the field, and another which is more “qualified” (with degrees from British and American universities) and apt at writing assessments, despite having little or no local knowledge and field experience. According to Karim, this discourse structure is reinforced by the nexus of NGOs, bureaucrats and English-language educated elites. They meet in seminars and conferences on poverty research, carried out in English, rendering microfinance inaccessible for critical scrutiny by the lay population. She likens the NGOs to “epistemic machines”. The author claims that vernacular critique of the NGO does exist, but remains overshadowed by the large body of NGO, donor and uncritical scholarly literature. But sadly, Karim gives these thoughts rather short shrift. She argues for job creation efforts like the Food for Work Programme in an effort to combat rural unemployment through public sector interventions. The general alternative to NGO discourses, however, as prescribed by her, is a strong civil society movement from within the citizen population, devoid of bureaucrats, NGOs and educated elites. But such movements, too, are not immune to the same power structures and class hierarchies which exist in other institutions. The brevity in her analysis of why alternative systems might be better make her outlook appear naïvely optimistic. Even civil society agitations face the obstacles of a heterogeneous society marked by class cleavages living under a post-colonial state. Such critique notwithstanding, the insights offered by Karim into the situation on the ground, which contrast with the optimism and success stories promoted through the NGO literature, are striking. Her book is a timely contribution to the debate on microfinance, and is a challenging and engaging read for the specialist as well as the lay reader. I believe that her ideas will serve as a guideline for future researchers’ and policy-makers inquiries into the gender aspect of microfinance. Optimistic claims about empowerment through microfinance will have a hard time standing up to her compelling argument. Soumya Mishra is a member of the Research Group on Institution Building across Borders at the Max Planck Institute for the Study of Societies and an Integrated Masters student in Development Studies at IIT Madras. This sounds like a interesting book but what about some evidence that the microcredits are also helping women? It sounds like Lamia Karim is only critical based on the case of Bangladesh. Maybe in Bangladesh there are many problems with poverty, but in other countries the women are benefiting more, for example in Ghana. The book is very new, so does it talk about what is happening in Andra Pradesh? « Shifting Baseline in Assessing Copyright Regulation? IP as Conceptual Pac Man!